Only $289 per barrel! Please contact us at ssbarrels@fuse.net if you would like a freight quote. The quote calculated for USPS or UPS will not be correct for this order! Will require to pallets! Condition: NEW! 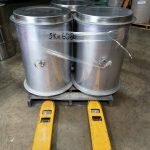 We have been searching for 30 gallon SS barrels for the past five years as we have received hundreds of calls regarding purchasing them. 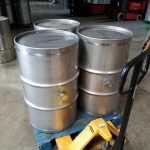 We still have not come across any used 30 gallon barrels, but have lucked out and purchased these barrels at a very good rate. These barrels usually sell for closer to $600 but we want to offer the best rates we can so we have priced them just under $300 for buying just one.